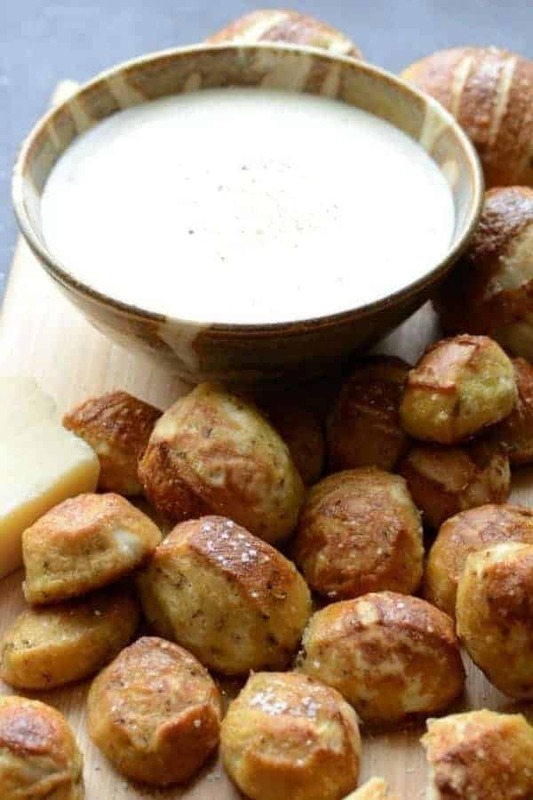 Delicious Parmesan pretzel bites made with Italian seasoning and Parmesan cheese dipping sauce make the perfect snack or appetizer. 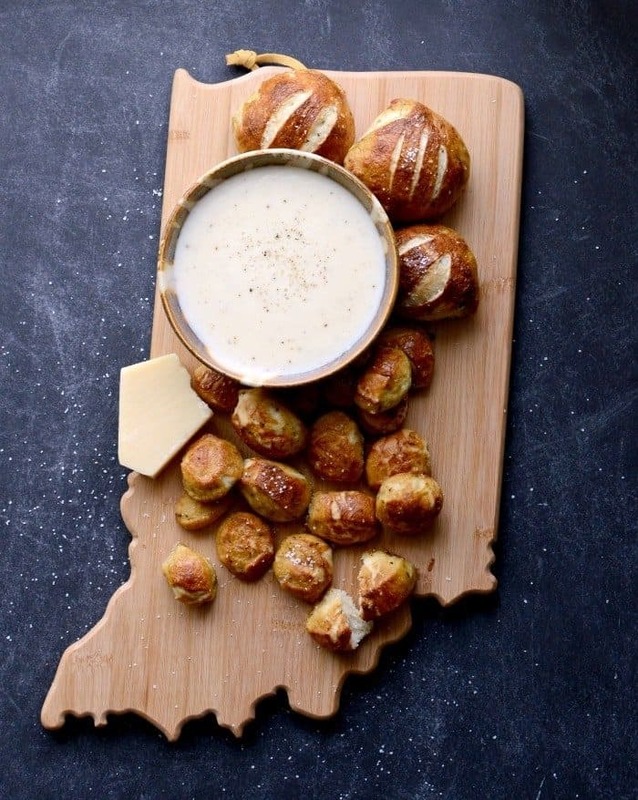 There’s so much to love about this recipe for Parmesan Pretzel Bites with Parmesan Dipping Sauce. Homemade soft pretzels are one of my favorite foods and they are so much fun to make with kids! I made these last week with my two little boys and it was a lot of fun. The best part though, we got to eat our fun! I like to think of foods that I make with my kids as food crafts, you know a project we get to work on together that you get to eat in the end. Really good soft pretzels dipped in really good cheese sauce needs to happen soon. It’s so good friends. 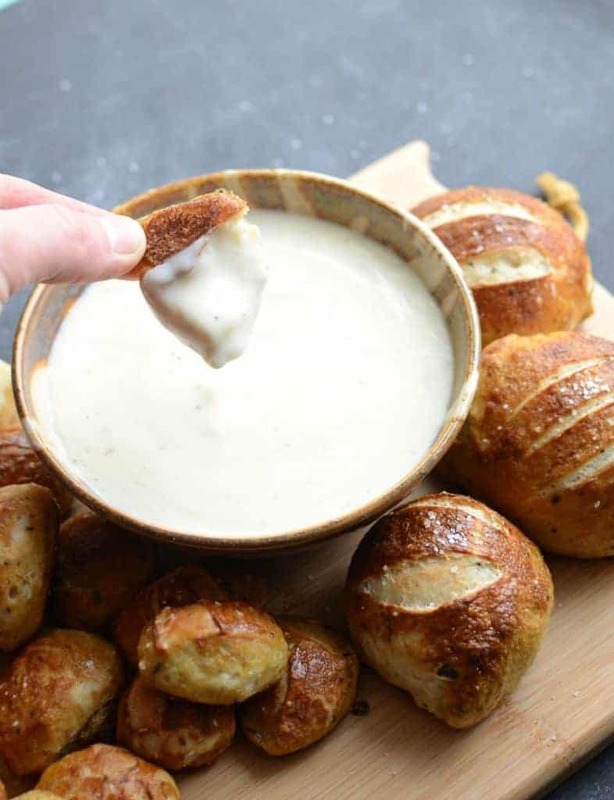 These Parmesan pretzel bites are awesome and a little different than your traditional soft pretzel thanks to the addition of Italian seasoning and Parmesan cheese to the dough. They are savory, soft, and chewy pretzel perfections. These are made in a traditional pretzel fashion by boiling the dough in soda water before baking. Don’t skip this step, it’s what gives the pretzels their signature chewy texture. To get the deep brown pretzel color, brush the boiled dough with an egg yolk and water mixture before baking.The Parmesan dipping sauce and a side of warm marinara make this dish an appetizer that can stand alone. My Indiana cutting board was a birthday gift! I get some many comments on it and it makes a great cheese board too. Get your state bamboo cutting board here. Healthy Slow Cooker Bean and Sausage Soup. In a large bowl, add warm water, sugar, salt, and yeast. Stir to combine and set aside for five minutes. When the yeast is bubbly, add half of the flour, the melted butter, Italian Seasoning, and Parmesan cheese. Stir until combined, and then add additional flour, ½ a cup at a time, stirring after each addition, until soft dough begins to form. Remove the dough from the bowl onto a lightly floured surface. Knead in additional flour, until dough is soft but not sticky. Knead by hand an additional 5-8 minutes. You can also use a stand mixer with a dough hook attachment. Form the dough into a ball, and place in a lightly greased bowl. Cover with plastic wrap and allow to rise for 45 minutes. Towards the end of the rising time, heat 3 quarts of water in a large stock pot to boiling. Add 2/3 cup baking soda, and stir to combine. Preheat oven to 450 degrees. After the dough has risen, remove from the bowl and divide into 10 equal parts. Working with one part of dough at a time, on a lightly floured surface, roll into a 10 to 12-inch rope. Cut each rope into 1-1 ½ inch pieces using a sharp knife or pizza wheel (This will make pretzel bites- you can also turn the rope into a traditional pretzel shape, tie them in knots, or twist the ends together, depending on the type you want. This is a great step to involve children.). Repeat with remaining dough, creating your desired pretzel shapes. Working with a few pieces at a time, carefully drop formed pretzels into boiling water. Boil for 30 seconds and remove from water with slotted spoon. Place on a parchment or baking mat-lined baking sheet. Repeat step with remaining pretzel dough pieces. In a small bowl, add egg yolk and water. Beat with a fork and combine well. Using a pastry brush, brush egg yolk mixture over dough and sprinkle with pretzel salt. Bake for 12-15 minutes, until pretzels are deep golden brown. 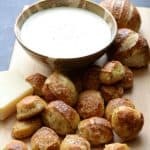 Pretzel bites will cook more quickly than traditional pretzels or pretzel knots. Remove the pretzels to a wire rack and cool for 5 minutes, before enjoying warm. To make the Parmesan cheese dipping sauce, heat a medium saucepan over medium heat. Add the butter. When the butter is melted, sprinkle the flour over the butter and whisk to combine. Let the butter mixture cook for 1 minute, whisking constantly. Slowly, whisk in the milk. Bring mixture to a slow simmer and simmer for 1 minute, until thickened. Add the Parmesan cheese and whisk until fully incorporated. Add salt and pepper to taste. Serve warm pretzels with hot Parmesan cheese dipping sauce and warmed marinara. This recipe is slightly adapted from and fully inspired by Gaby at What’s Gaby Cooking. I so appreciate you being here. I hope you have a great day full of warm soft Parmesan pretzel bites and melty cheese sauce. I am so bummed out….. ended up in town today and didn’t remember to buy any parmesan cheese ….. I can’t help but drool when I see this post! Can I justify going 140 miles to buy a wedge or two of cheese? Um ya…. I want, I need, I will have!!!!!! Definitely making these! Love the King Arthur pretzels you posted and excited to try a savory pretzel. My kids will love just having pretzel bites. And I just ordered an Indiana cutting board for a gift…thanks for the awesome gift idea! Yummy! This is going to be a conference snack! Thanks! These look amazing! I’ll be giving them a go! I have got to try this one soon. It looks and sounds so fab. 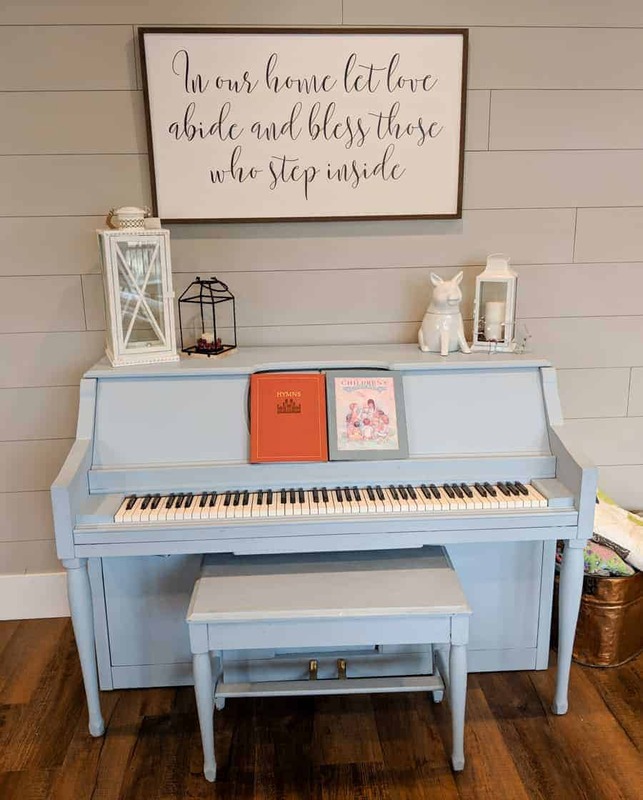 My daughter is going to love it. Oh my goodness, these look so delicious! And that dipping sauce puts it over the top, so yummy!